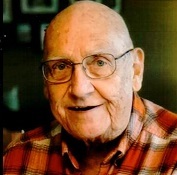 Obituary for William L. Klocke, Jr. | Laughlin Memorial Chapel, Inc.
Age 85, of Castle Shannon, on Wednesday April 10, 2019. Devoted husband of the late Mercedes Ann “Cede” Klocke; loving father of Michael (Lois) Klocke and Nancy (Bob) Dempsey; proud grandfather “Pup” of Bobby Dempsey, Emily (Matt) Shaffer, Jennifer (Fred) Abbondanza, Stephanie (Jeremy) Wittenberg and Mitchell Klocke; great grandfather “Pup Pup” of Briana and Emma Shaffer; he will also be missed by many nieces, nephews and friends. Bill was an Air Force veteran of the Korean War, a member of American Legion Post 490 and a Life Member (52 years) of the Castle Shannon Volunteer Fire Department. For almost 40 years, he owned his own hearing aid business, Allegheny Hearing Assoc. Family and friends will be received at Laughlin Cremation & Funeral Tributes 1008 Castle Shannon Blvd. on Friday 2-4 & 6-8 PM Mass of Christian Burial will be offered in St. Anne Church on Saturday at 9:30 AM. In lieu of flowers, memorial contributions may be made to the Alzheimer’s Association 1100 Liberty Ave. Suite E201 Pittsburgh, PA 15222 or to the American Cancer Society 320 Bilmar Dr. Pittsburgh, PA 15205.